Digital World Biology does not share or sell personally identifiable or non-personally identifiable information. Digital World Biology does not knowingly collect or solicit personal information from anyone under the age of 13. Both Molecule World and the MW DNA Binding Lab allow users to save images of molecular structures for use in school assignments such as laboratory reports, in support of the common science practices described in the Next Generation Science Standards. Students without Facebook or Twitter accounts are unable to post images from the Molecule World or Molecule World DNA Binding Lab apps. 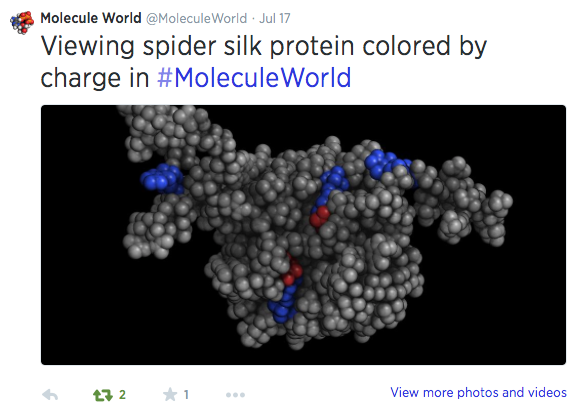 However, if a student has a Twitter or Facebook account AND they have these applications on their iPad AND they have linked these applications to the app, they are able to post images of DNA or other molecular structures on Twitter or Facebook, such as the example shown here from one of the spider silk proteins. 1. Use the iOS parental controls to enable restrictions on the device. 2. Use the iOS parental controls to restrict access to the Facebook or Twitter apps. Digital World Biology has a monthly newsletter with science activities and interesting molecules that can be viewed with our applications. These newsletters are written for teachers, students (over 13 years of age), and scientists. If you subscribe to our newsletter, your email will be stored in MailChimp. If you believe your child has subscribed to the newsletter or if you have subscribed and wish to opt out of receiving our newsletters, either contact us and ask to be removed or use the unsubscribe link at the bottom of any of our newsletters. All subscription information will be deleted.